Mladá Boleslav / Paris, 1. 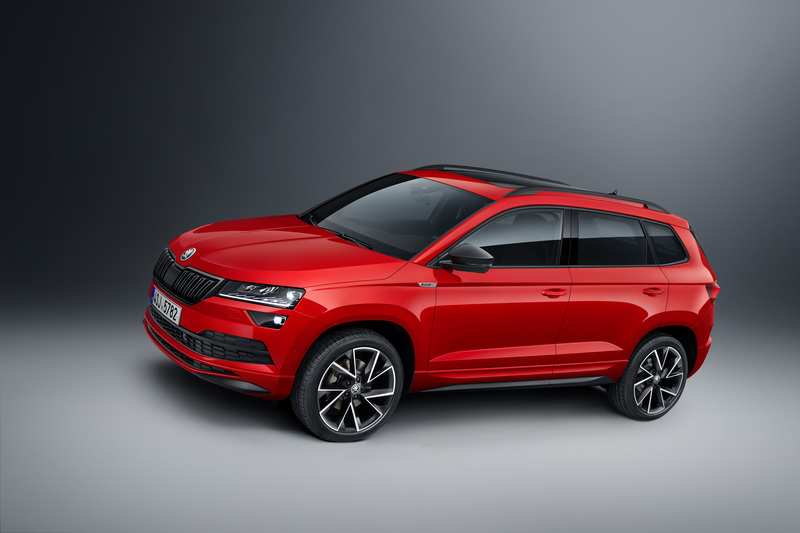 October 2018 – With the launch of the new ŠKODA KAROQ SPORTLINE, ŠKODA is presenting a particularly sporty compact SUV. 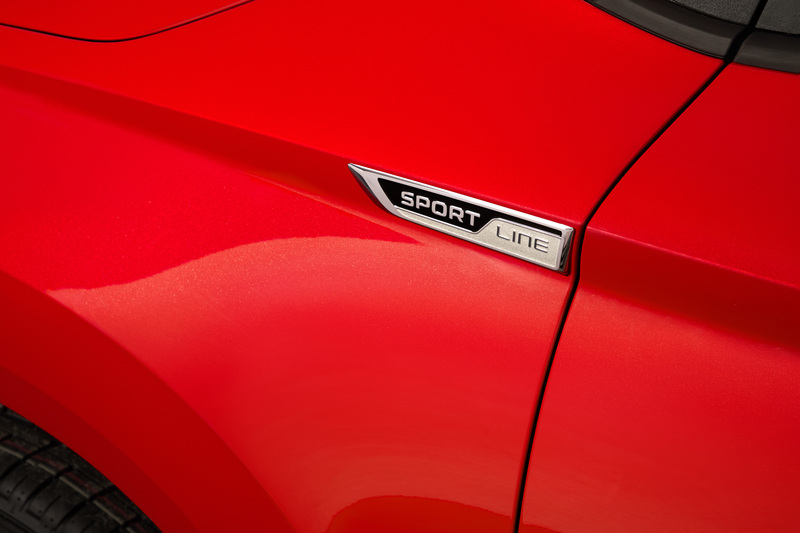 In the SPORTLINE variant, the emotive design of the versatile compact model is further refined. Numerous black elements highlight the dynamic appearance, which is perfectly complemented by the new 140-kW 2.0 TSI engine (190 PS). 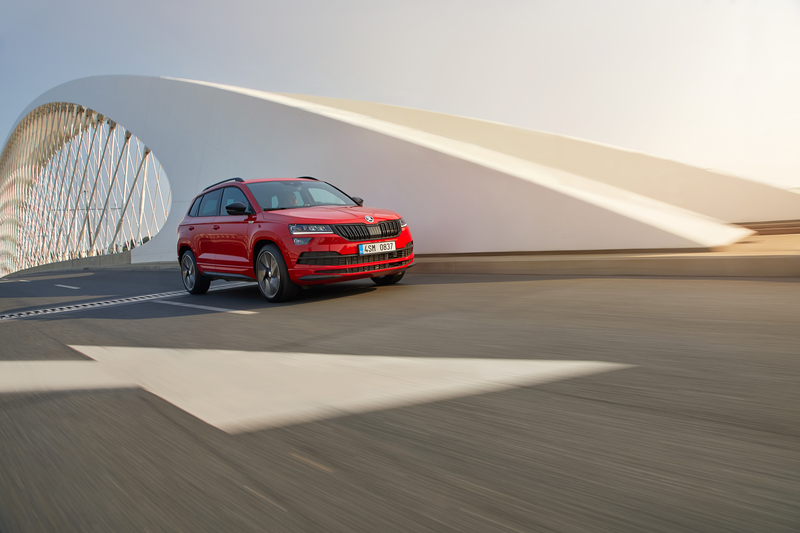 The most powerful petrol engine in the range is exclusively available for the ŠKODA KAROQ SPORTLINE. 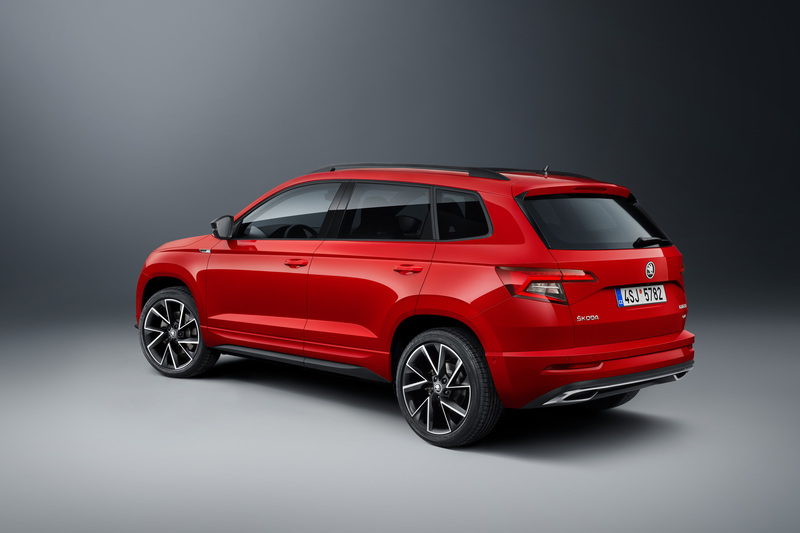 The KAROQ was introduced in 2017 as the second model from ŠKODA’s SUV campaign. 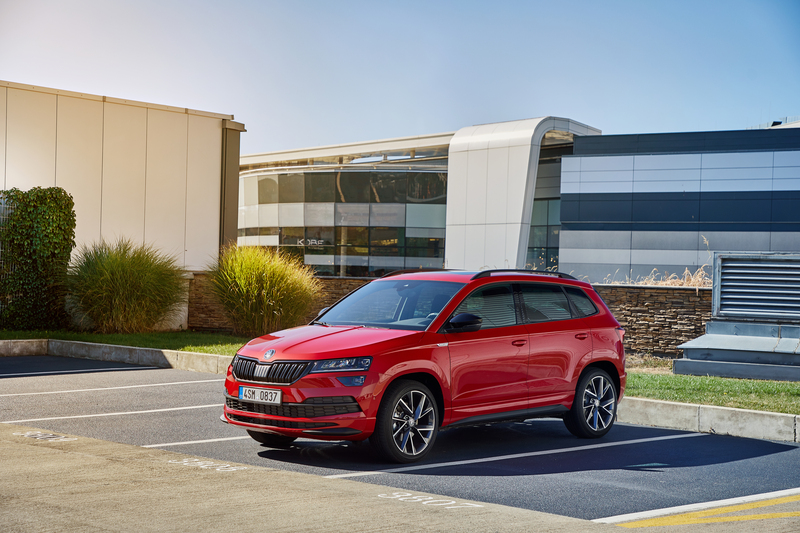 It transferred the clear and emotive design language into the compact SUV segment whilst offering space for occupants and their luggage despite its compact dimensions. In addition, state-of-the-art technology further improves safety and comfort. 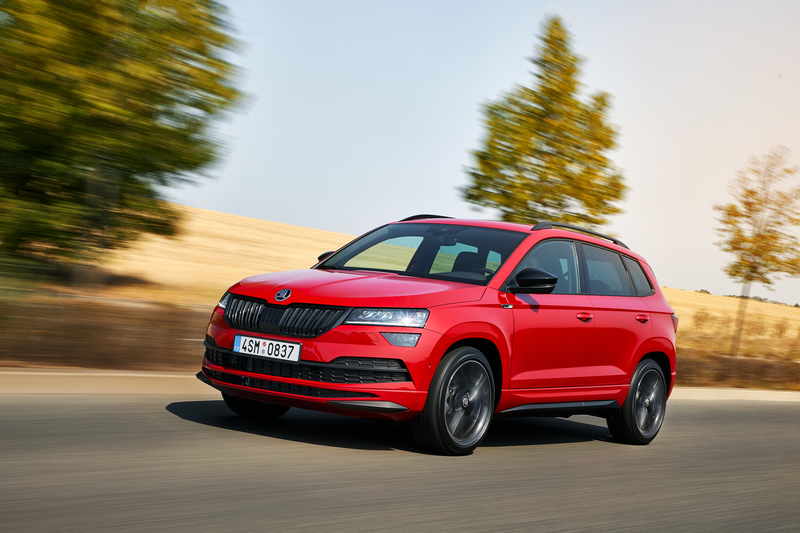 The SPORTLINE adds a new ŠKODA KAROQ variant specially designed for sportiness, which makes this model range even more attractive and will also appeal to new customer groups. 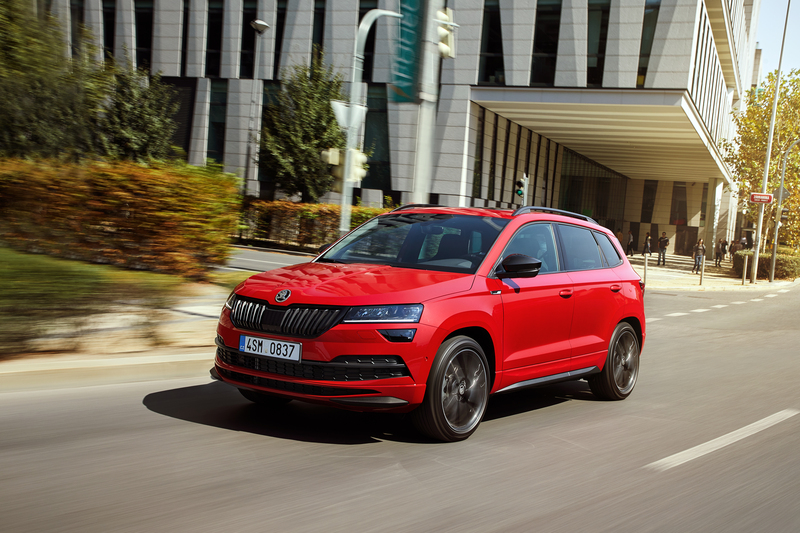 Under the bonnet, the ŠKODA KAROQ SPORTLINE underlines its sporty ambitions with a 140 kW 2.0 TSI engine (190 PS), which is exclusively reserved for this variant of the KAROQ model range. 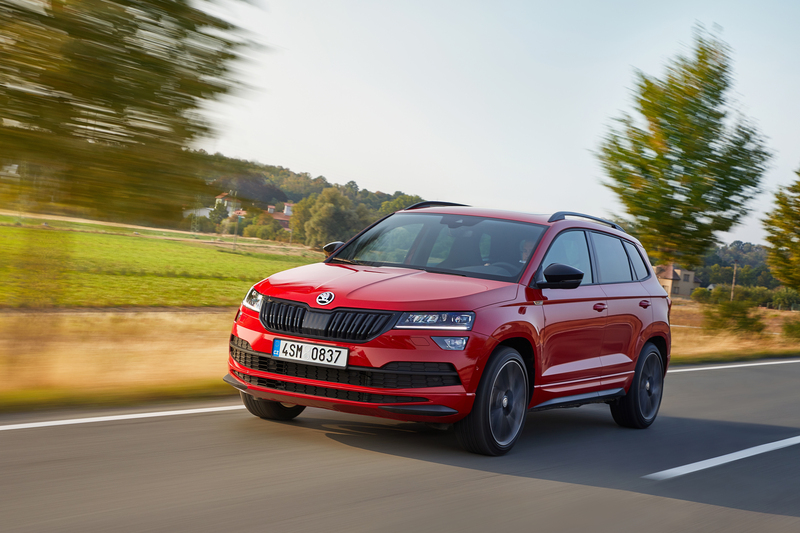 The all-wheel drive, which comes as standard when combined with this engine, further improves the car’s agile handling and offers additional safety. 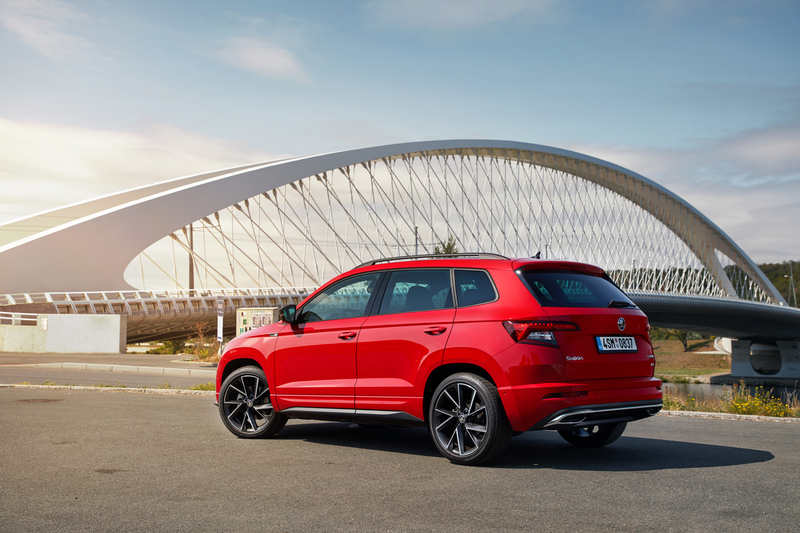 The 18-inch Mytikas alloy wheels and numerous elements such as the radiator grille and rear diffuser – all in gloss black – give the exterior a sporty look. 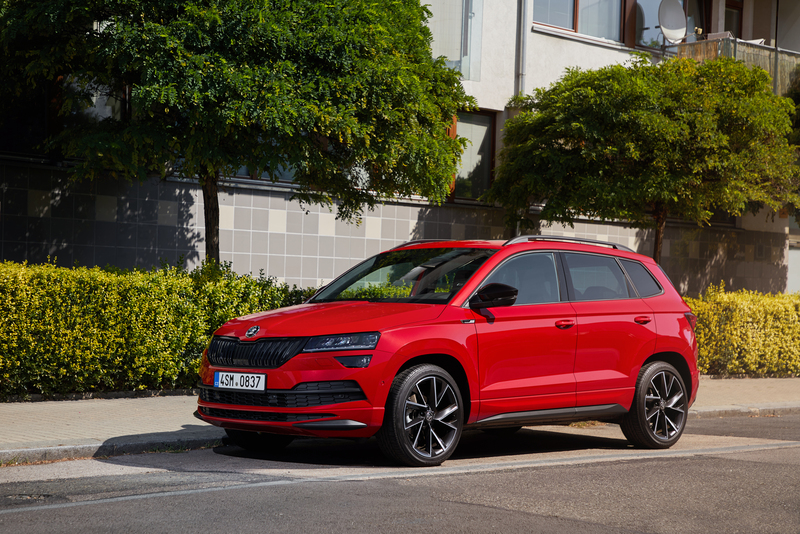 In the interior, other sporty highlights include black sports seats with new fabric covers and contrasting silver stitching, the multifunction sports steering wheel and stainless-steel pedal covers. A special logo on the infotainment system screen welcomes the driver. The optional virtual cockpit features a special SPORTLINE layout. 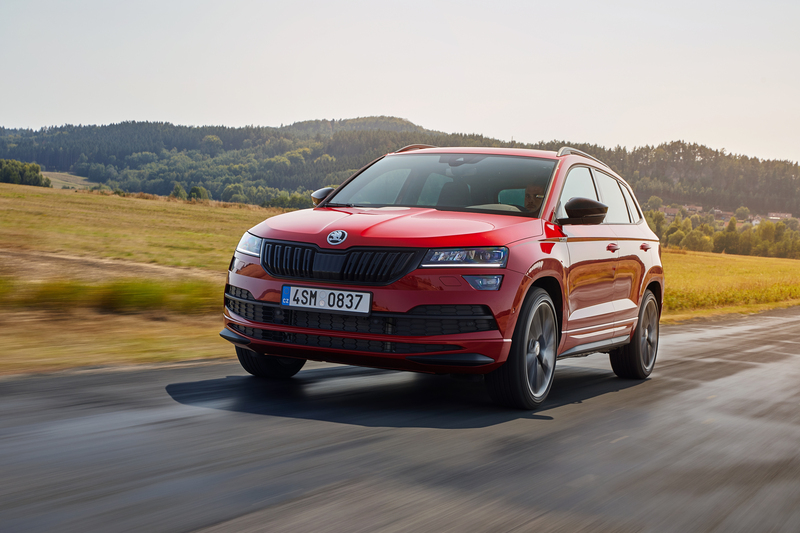 The ŠKODA KAROQ SPORTLINE offers a choice of four efficient and eco-friendly engines, all of which comply with the Euro 6d-TEMP emissions standards. 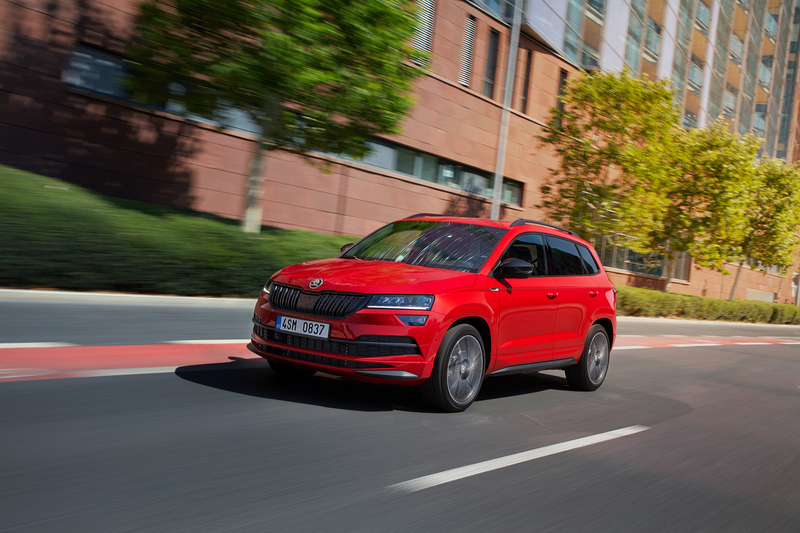 The highlight is the most powerful petrol engine in the range – exclusively reserved for the KAROQ SPORTLINE: the 2.0 TSI engine transfers its 140 kW (190 PS) to all four wheels via a 7-speed DSG. 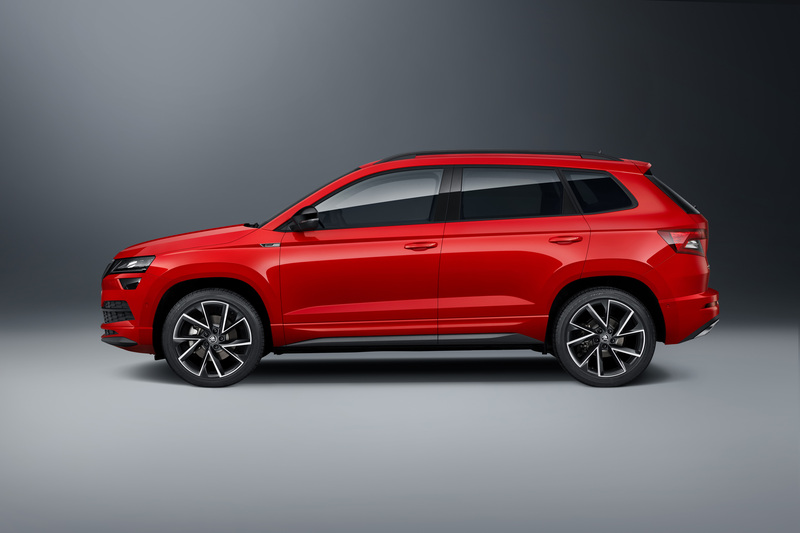 The 1.5 TSI petrol engine, which is available in addition to the 2.0 TSI engine, has a power output of 110 kW (150 PS) with a combined fuel consumption of 5.3 l/100 km thanks to automatic cylinder shutdown. The 1.5 TSI engine comes with a manual 6-speed transmission as standard; a 7-speed DSG is optional. 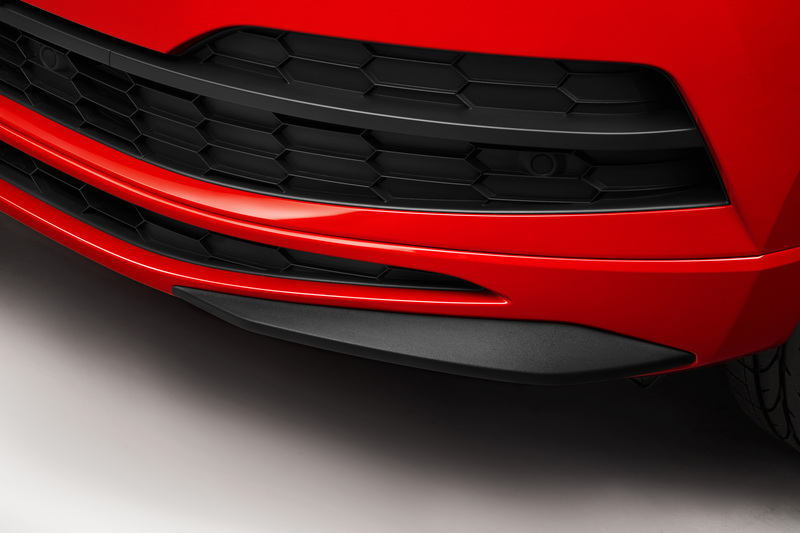 Both TSI engines are fitted with a petrol particulate filter. 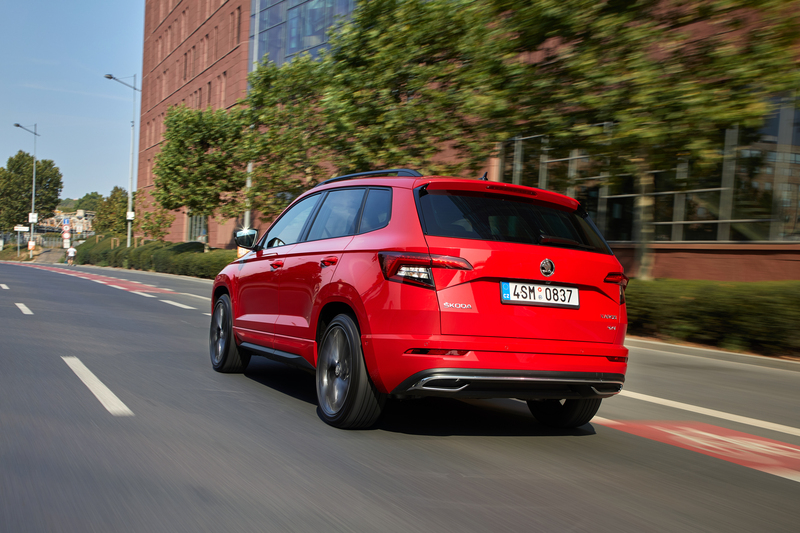 The two 2.0 TDI diesel engines for the ŠKODA KAROQ SPORTLINE offer the same levels of power as the petrol engines. 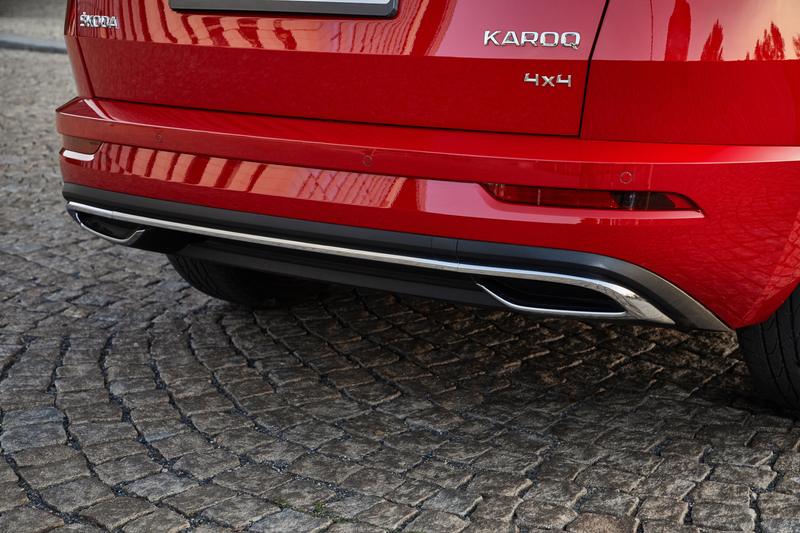 Standard equipment includes an SCR catalytic converter with AdBlue injection and a diesel particulate filter. The engine with 110 kW (150 PS) powers the front wheels via a manual 6-speed transmission as standard. 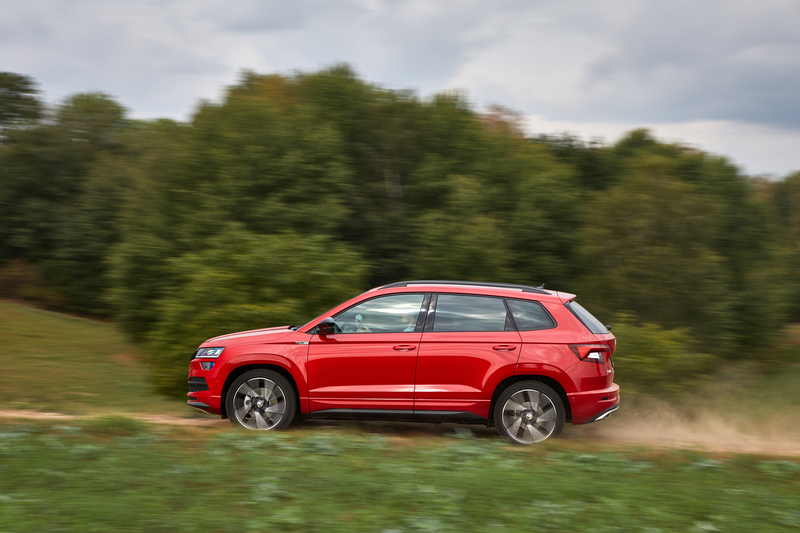 All-wheel drive is available as an option, as is a 7‑speed DSG coupled with all-wheel drive. 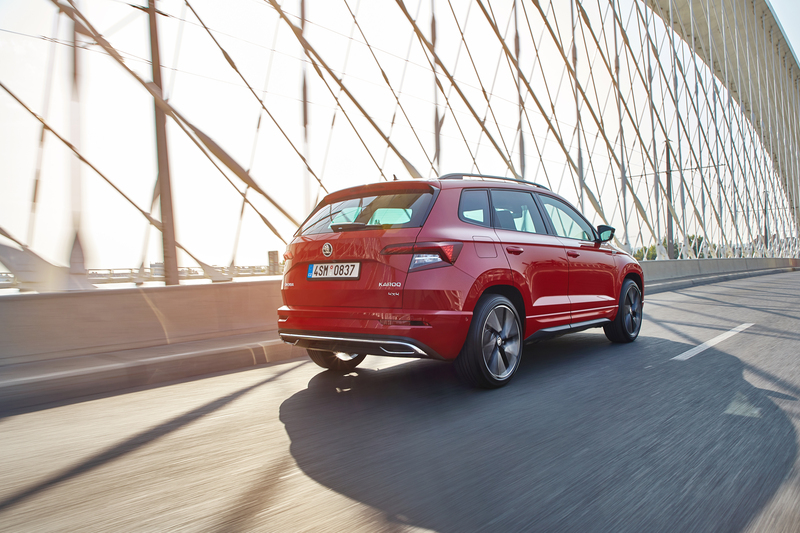 The 140-kW 2.0 TDI (190 PS) comes with a 7-speed DSG and all-wheel drive as standard. Depending on respective surface conditions, the permanent all-wheel drive (5th generation) distributes the power to individual wheels variably. This improves the car’s agile handling and offers additional safety, for example with increased traction on slippery surfaces. 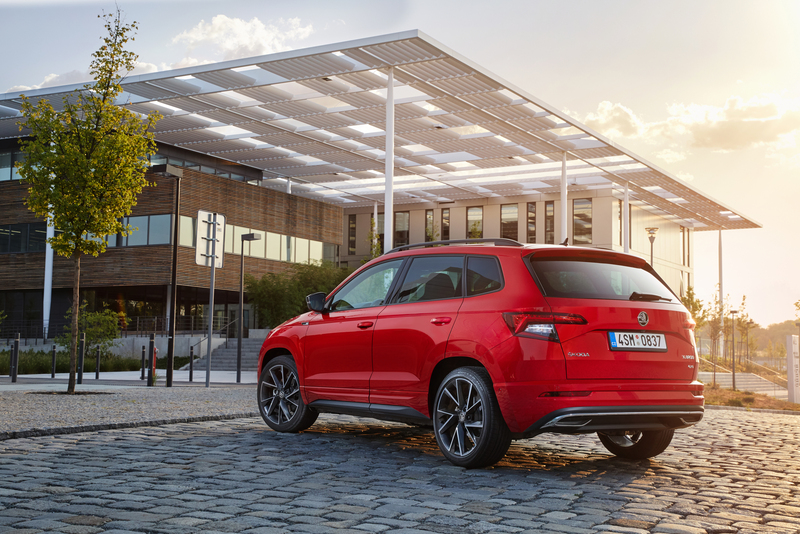 The Sound Generator function, which offers occupants an impressive and more unique note, is newly available for the ŠKODA KAROQ SPORTLINE with the 140-kW (190-PS) 2.0 TSI or TDI engines. The Sound Generator function is exclusively available with Driving Mode Select and is therefore part of the ŠKODA KAROQ SPORTLINE’s standard equipment. 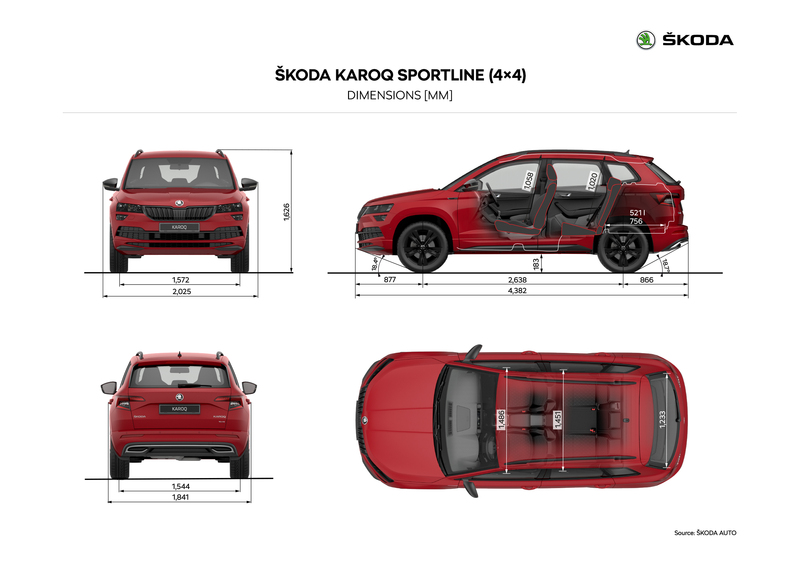 The SPORTLINE variant of the ŠKODA KAROQ is getting an even sportier touch. 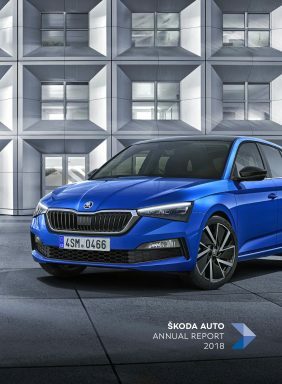 Besides the body-coloured sporty front bumper, the radiator grille, wing mirror housings and rear diffuser are particularly eye-catching – all finished in gloss black. 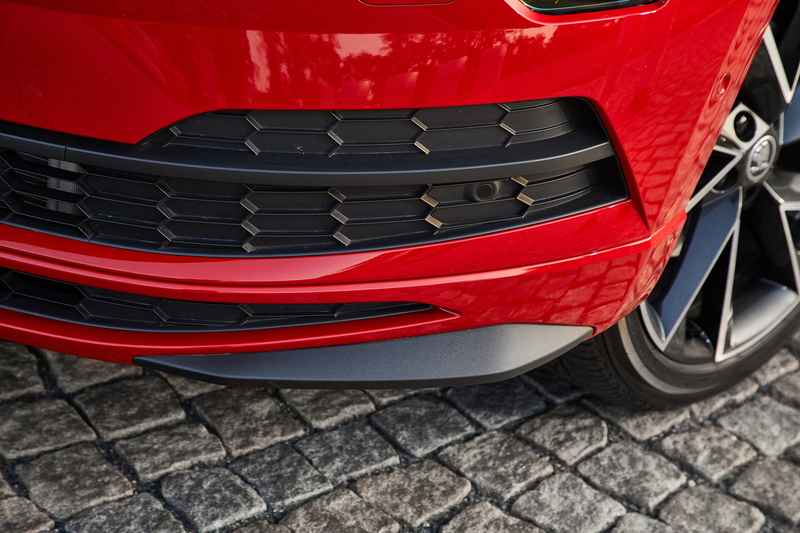 The exclusive 18-inch Mytikas alloy wheels are also in gloss black, as are the optional 19-inch Vega alloy wheels. 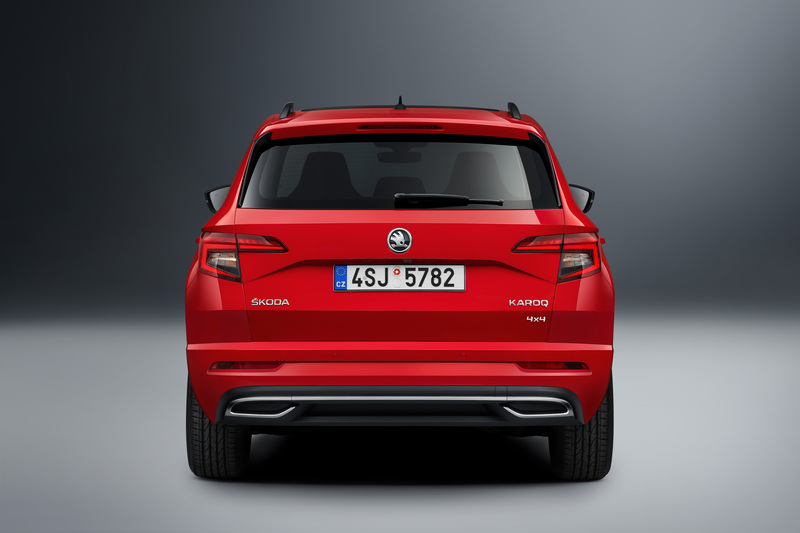 SPORTLINE badges on the front wings clearly identify the most dynamic variant of the ŠKODA KAROQ. 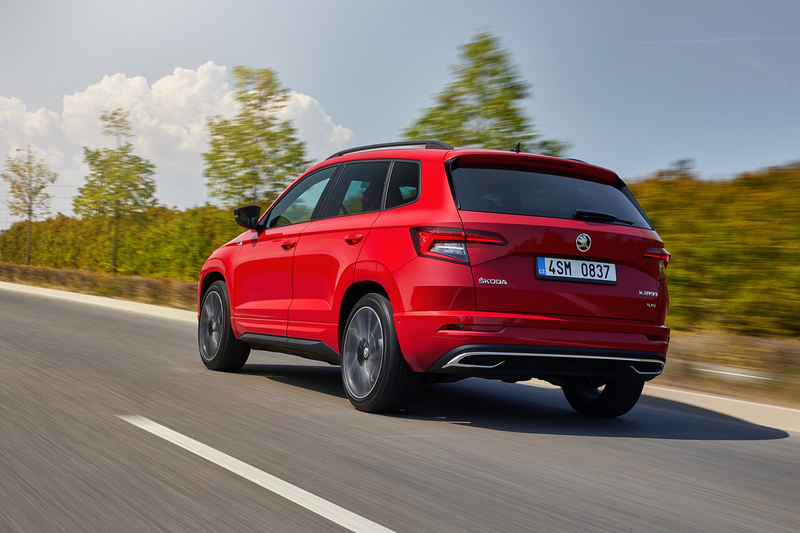 The body-coloured protective side trims, tinted windows (Sunset) and the black roof rails provide elegance; the exhaust system’s visible silver decorative tailpipes form another accentuated detail. The interior features striking black seats with contrasting silver stitching. Their covers are made from three layers of breathable new ThermoFlux fabric, offering occupants exceptional comfort particularly in the summer. The front seats feature lumbar supports. The multifunction sports steering wheel with perforated black leather also exhibits contrasting silver stitching, as do the gearstick with gaiter and the centre armrest as components of the small leather package. The decorative strips on the instrument panel come in Piano Black, whilst the strips in the door trims are finished in a carbon-fibre decor. 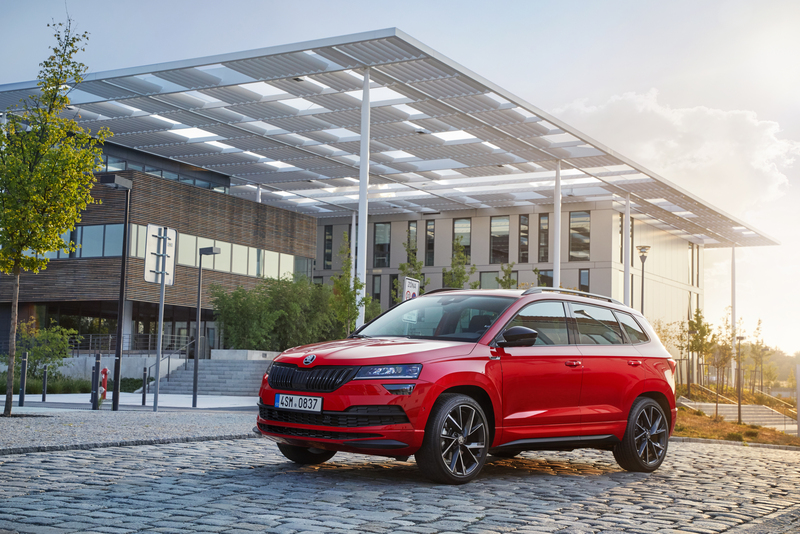 Stainless steel pedal covers, a SPORTLINE logo on the instrument panel, KAROQ logos on the door sills, a black roof lining, black roof pillars and an LED package with ambient lighting complete the sporty appearance. The optional virtual cockpit offers the driver a choice of various layouts. The virtual cockpit is now also available with a fifth display layout: Sport. The current speed is shown in the centre of the display. The selected radio station and the driving data are shown on the right and left. There is space for information on the current engine output and oil temperature in the lower part of the display. The virtual cockpit in the SPORTLINE variant has a modified carbon-fibre effect (sport skin), which changes the foreground and background of all five display layouts. 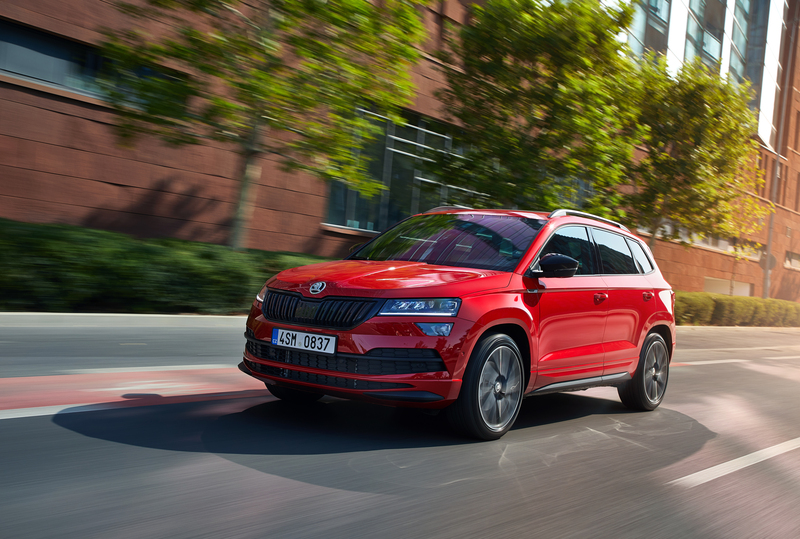 The optional SmartLink+ technology provides comprehensive connectivity options in the ŠKODA KAROQ SPORTLINE. The system allows Apple CarPlay, Android Auto, MirrorLink™ and SmartGate to be integrated into the car. 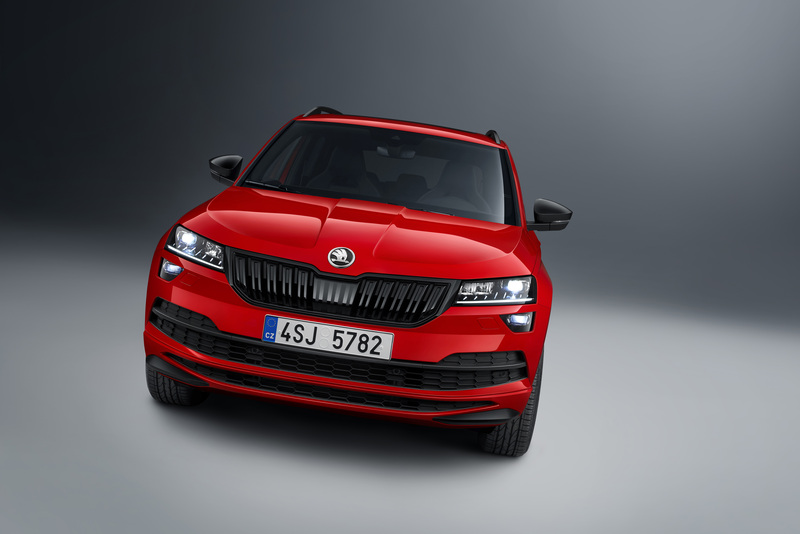 ŠKODA Media Command allows the infotainment system’s functions to be controlled on up to two connected tablets. 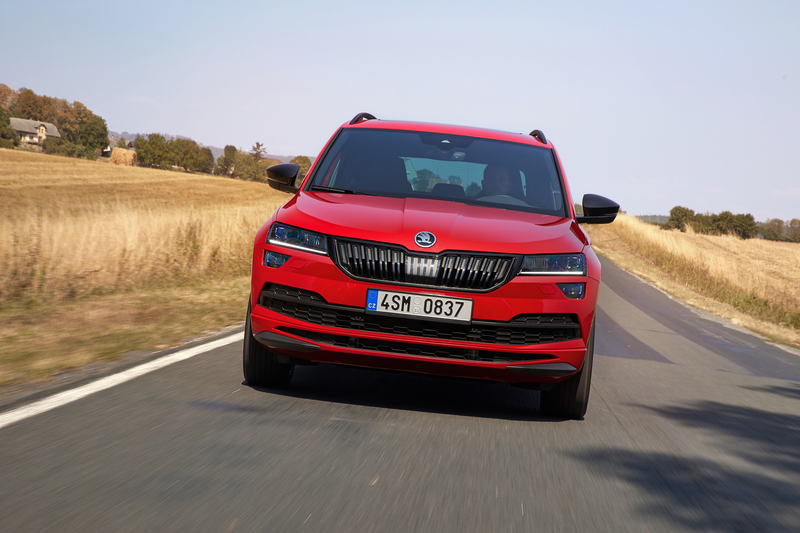 The ŠKODA Connect mobile online services consist of Infotainment Online, Care Connect and Emergency Call. 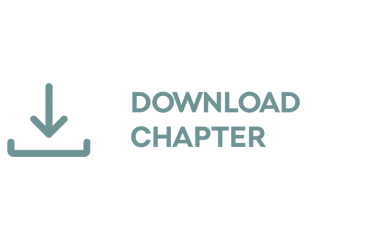 Infotainment Online services include, for example, Online Traffic Information, and the Care Connect services include the Proactive Service function, which establishes a connection to customer care or a garage if necessary. 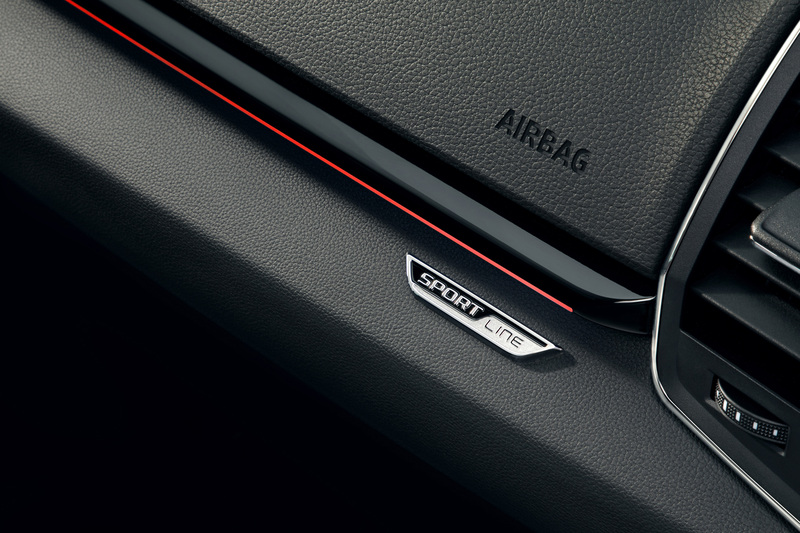 The Emergency Call can be made manually; however, it will automatically call for assistance when the airbags or belt tensioners have been deployed. 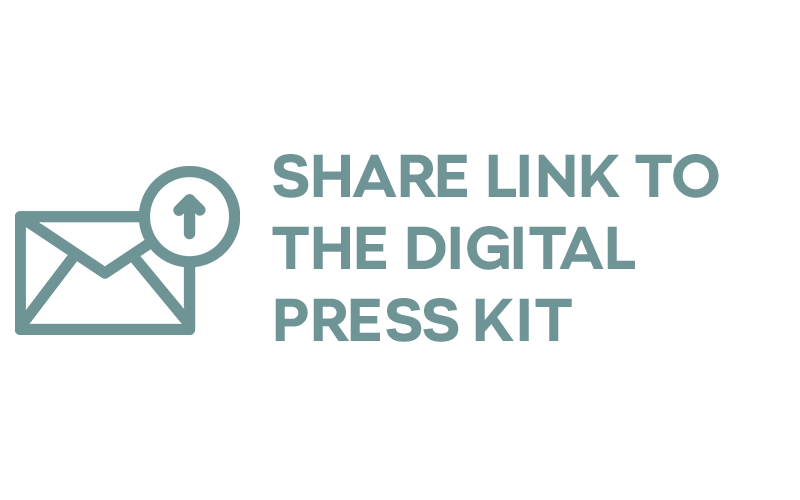 Digital devices can be paired via a Bluetooth interface; compatible mobile phones can also be charged wirelessly in a Phonebox. 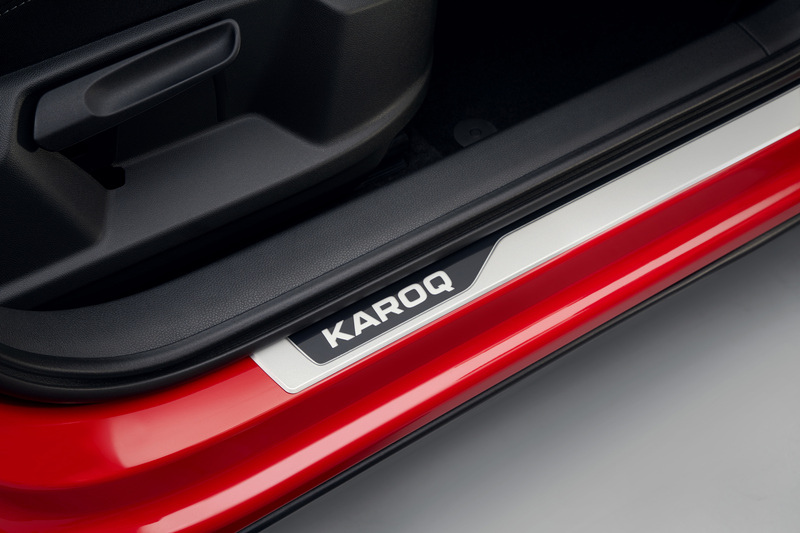 The KESSY keyless entry system, which comes as standard, also enables use of the optional electric tailgate incl. tip-to-close function. 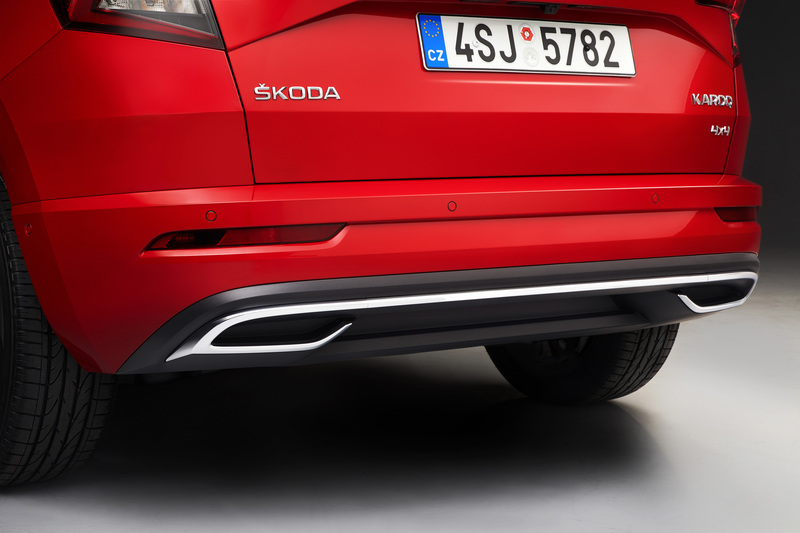 The tailgate opens and closes at the push of a button or if it is gently pulled; if desired, it can be opened with just a slight foot movement on a virtual pedal below the rear bumper. Safety is improved by the auto-dimming rear-view mirror and the Light and Rain Assist function, which automatically adjusts the lighting in the rain or dark. 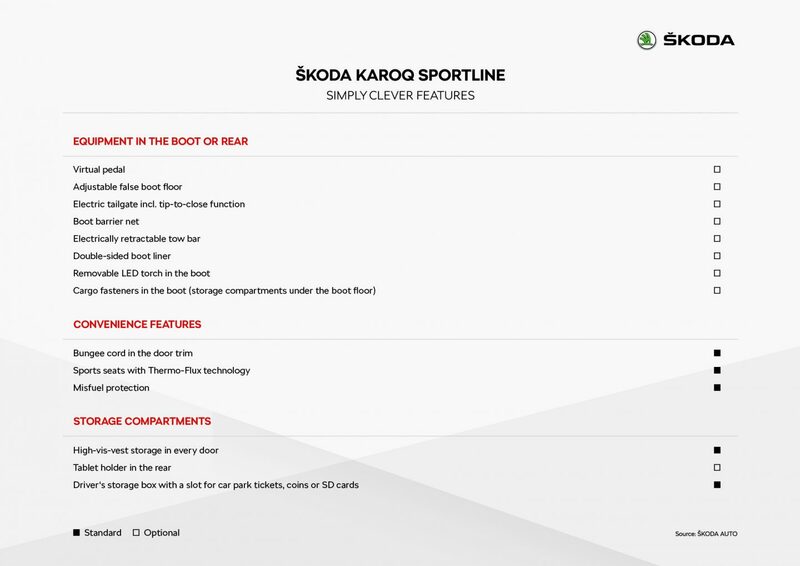 The driver can adjust the driving dynamics of the ŠKODA KAROQ SPORTLINE via Driving Mode Select; the Electronic Stability Control function (ESC) features two levels. 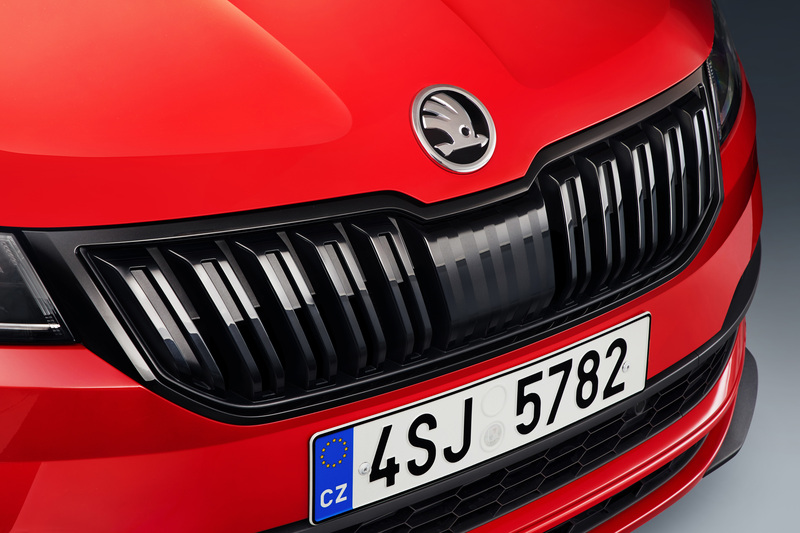 In typical ŠKODA style, there is a wealth of Simply Clever features and storage options. The adjustable false boot floor and the tablet holder in the rear improve the car’s suitability for daily use, as does a driver’s storage box with a slot for car park tickets, coins or SD cards.